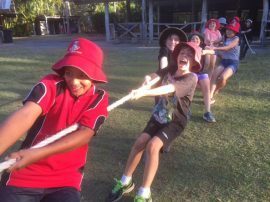 Whitsunday Anglican School has a developmental Outdoor Education Program intended to focus on the growth and development of students as individuals, their ability to interact with others, and their ability to function within their environment. Outdoor Education Week is held in September each year. The Outdoor Education Program is an integral component of the total curriculum offerings, concerned with the development of the whole person as identified in the school’s Mission Statement. 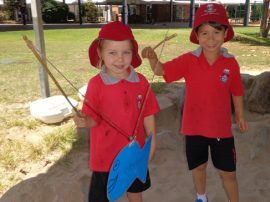 Participation is compulsory for all students with camp programs from Kindergarten to Year 12. The cost of this program is now included in the annual curriculum levy spread across four terms. The Outdoor Education Program’s primary focus is the annual whole school camp week. The objectives of these camps are the progressive and sequential development of skills and knowledge deemed desirable in maturing young people. Students in the Early Childhood Centre learn skills such as sharing and coping without parents. Students in the Junior and Middle Schools extend the skills and knowledge to caring for selves and others and coping with extended absences from home comforts. 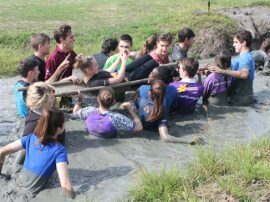 For the Senior School, the camps incorporate major academic components relating to life including leadership seminars, as well as physical outdoor challenges designed to enhance personal development. Overview: The children will complete a scavenger hunt to identify the various mini beasts found at the Botanic GardensLearning and Outdoor Educational Outcomes. Overview: The children will tour the workshop and see the giant sized tools that are used to fix the different types of machinery. They will get up close to diggers and trucks and eat morning tea in the crib room. Learning & Outdoor Education Outcomes: Extending on children’s interest in trucks and heavy machinery. 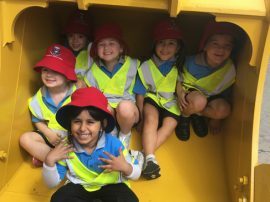 Example Activities from Camp: Touring the workshop, ‘Driving’ the diggers and trucks, Morning tea in the crib room, Wearing safety vests. Friday: Sandfly Creek and Beach Activities. Learning and Outdoor Educational Outcomes: Promotion of social skills, teamwork, confidence, environmental education, bicycle & road safety. Example Activities from Camp: Excursion to Greenmount Homestead to explore the past history of Mackay. Sandfly Creek Board Walk: nature walk, picnic. This may be the first experience students have with sleeping away from home with the highlight of the week being our sleepover at school. Students also participate in a variety of environmental based activities. Learning and Outdoor Educational Outcomes: Developing vital personal and social capabilities such as teamwork (Getting Along), resilience, confidence and persistence as well as caring for our environment. 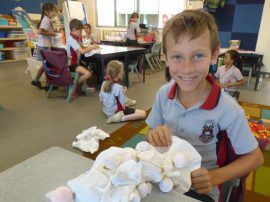 Example Activities from Camp: Overnight sleepover at school, Excursion to Mackay Recycling Facility and Botanic Gardens, Science experiments and Craft activities at school. Students participate in daily out of school activities. Learning and Outdoor Educational Outcomes: Developing essential personal and social capabilities such as communication, resilience, self-confidence, leadership, teamwork, goal setting, personal autonomy and initiative. 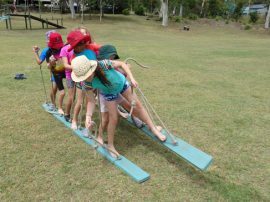 While at Camp Kanga students participate in various team-building activities in preparation for the added responsibilities of being a Year 4 leader. They also visit the Whitsunday Crocodile Safari where they engage in crocodile spotting and experience and learn about the local indigenous flora and fauna. Learning and Outdoor Educational Outcomes: Providing direct personal contact with nature in ways that promote enjoyment of outdoor activities and nature. This enjoyment can be the basis for ongoing outdoor recreation and nature experiences through their lifespan, supporting personal health and wellbeing and providing the foundations for ecological literacy. Developing essential personal and social capabilities such as communication, resilience, self-confidence, leadership, teamwork, goal setting, personal autonomy and initiative. Identifying the importance of Country and Place to the Aboriginal culture. We will be staying in cabins and the Camp will involve a variety of activities which are designed to enhance the Geography and Science units we are currently studying. The area provides a safe venue for students to learn new skills such as fishing and bush walking. The proximity to Cape Hillsborough will allow us to learn more about National Parks and the plants and animals there. Example Activities from Camp: Bush-walking, orienteering, environmental art, fishing, rock-climbing, sand sculpting, cooperation games and a variety of beach sports. The Year 5 Outdoor Education Program heads south to the Action Challenge Camp ground at Haypoint where they enjoy a fun filled action packed week. They use a wide range of structured physical activities to provide them with hands on experience in problem solving, calculated risk taking, team work and friendship building. At each stage of the ACTION CHALLENGE program tasks and problems solving activities will become more and more difficult. This is designed to encourage lateral thinking processes, leadership skills, teamwork and greater involvement from the students. Of a night time the students will participate in talent shows, team building activities, mini Olympics and a well-deserved movie night. The students sleep in tents that they themselves are required to erect on the first day. At the end of the week the students walk away with a sense of achievement and new skills to reflect and draw upon when faced with future challenges in life. The food is plentiful and the camp grounds reflect that of a bygone era. 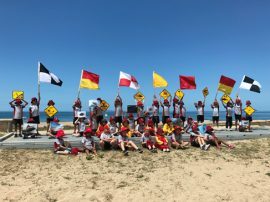 Year 6 adventure to Conway Beach and camp in the grounds of Conway Beach Tourist Park. The facilities include a pool, water park, jumping pillow and tennis court. Students build on the skills of their Year 5 experiences which include erecting tents, working collaboratively and personal challenge activities. An underlying focus is character development and emerging leadership skills reflected in themes drawn from the 6 Pillars of Character. (Trustworthiness, Respect, Responsibility, Fairness, Caring, Citizenship). 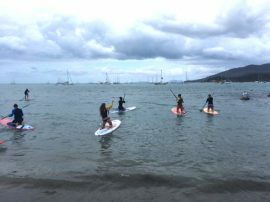 Past activities have included, but are not limited to: hiking at Mt Rooper, Airlie Beach board walk and lagoon visits, Stand up Paddle boarding and Kayaking, Kite making and flying, Beach activities/challenges, Fishing, creating team bandana’s and basic first aid. Year 7 students will travel to the Fairbairn Dam Outdoor Education Centre located 25km south of Emerald and sleep in large 4 person semi-permanent tents. Facilities are basic but adequate and encourage students to take part in tasks such as meal preparation and looking after their group environment. They include the tent area, activities hall, beach volleyball area, Fairbairn Dam and the natural outdoor environment. Students build on the skills of the Year 7 Leader in Me Day which include working collaboratively and personal challenge activities. There is an intentional focus on communication, teamwork, resilience and growth through challenge and Leadership. Activities will be structured to achieve outcomes at both group and individual levels. Problem solving in deliberate scenarios or as part of working effectively as a team allows the students to use higher order thinking skills to achieve success. Possible activities include challenging high ropes, climbing, abseiling, low ropes and group challenge and wet activities such as canoeing, raft building, sailing and swimming. 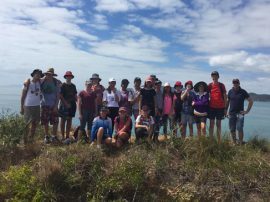 Year 8 travel to Airlie Beach. Students build on the skills developed during their previous Middle School camping experiences including; erecting tents, working collaboratively and personal challenge activities. There is also an element of exploring some leisure activities as a group. This camp has a focus on teamwork and personal development while maintaining the underlying themes drawn from the 6 Pillars of Character and our focus on developing leadership skills. The Year 8 Outdoor Education week is also an opportunity for the cohort to acknowledge their final year of Middle School together and further strengthen friendships and memories. One of the more “adventurous” camps. Camp groups rotate through activities in and around Seaforth. In similar fashion to the television show “survivor”, the groups and individuals participate in challenges to gain rewards. 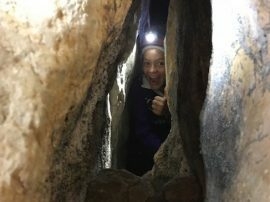 Although all nights are away from home, this camp also challenges students to spend one night on an island with improvised camping equipment and shelters. Learning and Outdoor Educational Outcomes: Teamwork, Team Dynamics and Team Building, Personal Challenge, Problem Solving, Tent and Shelter Construction, Camp Cooking, Navigation, Recreation. 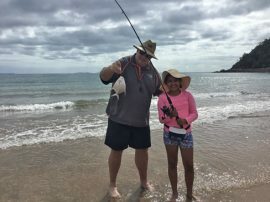 Example Activities from Camp: Games and Sports, Problem Solving Activities, Hiking,Golf at Halliday Bay Golf Course, Archery, Fishing, Swimming, Beach Games. A challenging, yet extremely rewarding camp. Each group will experience 3 days/2 nights hike of the Great Whitsunday Walk. One night at base camp with some downtime in Airlie. Sea Kayak to South Molle (approx. 1 ½ hours), overnight camp on South Molle Island. Learning and Outdoor Educational Outcomes: Bushcraft, Navigation, Hiking and Camping, Develop organisational ability both personally and in groups, Teamwork, Team Dynamics and Team Building, Personal Challenge, First Aid, Safety, Procedures to follow when injured or lost, National Park Etiquette, Problem Solving: Tent Construction, Backpack Packing, Camp Cooking, Sea Kayaking. Example Activities from Camp: Hiking, scavenger hunts, campsite games, kayaking, swimming, snorkelling, stand up paddle boarding camp meal preparation. The theme for the Year 11 Camp is Leadership for Life and will be held in Brisbane. 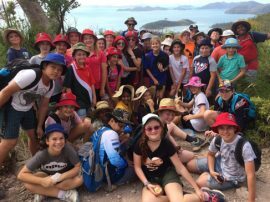 The camp will provide an opportunity for students to explore the notion of leadership during their final year at Whitsunday Anglican School and beyond. There are two main focuses for student development of the Year 11 Camp. The first focus is on leadership and team development. The camp provides a key opportunity for students who have leadership aspirations to display their leadership capabilities as well as receive training and guidance on how to be a successful leader. The second focus is exposing the students to the various pathways that are available to them at a tertiary level. Students will visit a number of universities allowing them the opportunity to explore faculties of interest, campus facilities and accommodation. The camp will also allow students to develop an understanding of big-city living and begin thinking about their preferred options after school. Learning and Outdoor Educational Outcomes: Students will take part in a variety of activities which promote skills in teamwork, problem solving, self-awareness, career planning, development of a leadership vision, life-skills and service learning. Example Activities from Camp: These skills are fostered and celebrated through activities including outdoor education challenges, practical seminars conducted by yLead, team-building challenges, visits to a number of tertiary educational and accommodation facilities, guest presentations by experts in the field of leadership, opportunities to communicate with past scholars and attendance at the Leadership Dinner, amongst others. 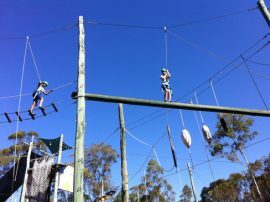 This camp is regarded as a recreational camp for Year 12 students to wind down, relax and have some fun given the gruelling schedule of exams, assignments, QCS testing and other leadership, service and co-curricular activities they may have undertaken during their final year of high school. Students will be given the opportunity to spend quality time with each other, to eat well, to exercise in the fresh air and sunshine and if necessary to catch up on some much needed sleep. We hope they (and their teachers) return refreshed, cheerful and energised – ready to tackle the challenges presented in their final term. 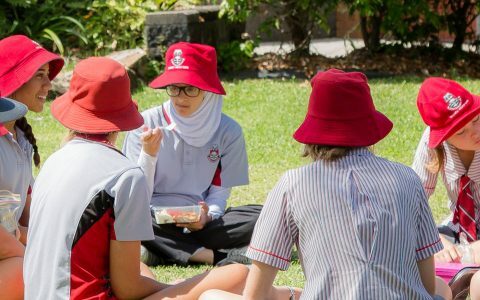 Learning and Outdoor Educational Outcomes: Students are encouraged to demonstrate leadership, organisation and self-direction as they choose from a variety of activities available. There is an expectation that students conduct themselves in a responsible and mature manner as they mix with other families at the resort. 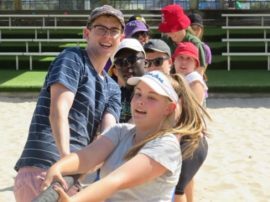 Example Activities from Camp: Adventure, Aquatic and Team-Building and Leadership Challenges including beach games, water polo, aqua fit, team building and theatre sports. A visit to Wet n Wild and Movie World is also planned. At night, there will be a DJ disco party, trivia and a movie night for all to enjoy.